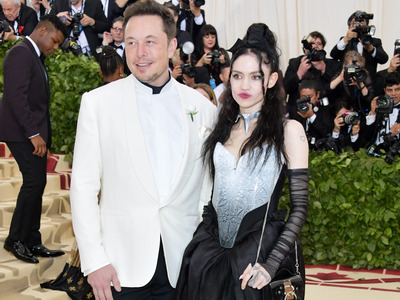 Jason Kempin/Getty ImagesElon Musk and Grimes at the 2018 Met Gala. Elon Musk and the indie musician Grimes took both the business and music worlds by surprise in May when they first revealed they were dating. 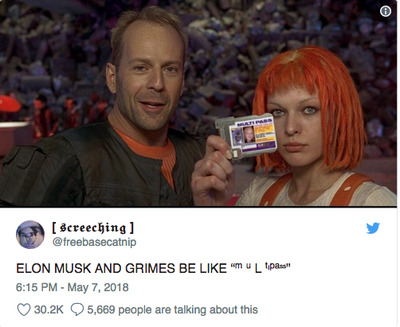 Since then, Grimes, whose real name is Claire Boucher, has also found herself involved in some of Tesla’s narrative. 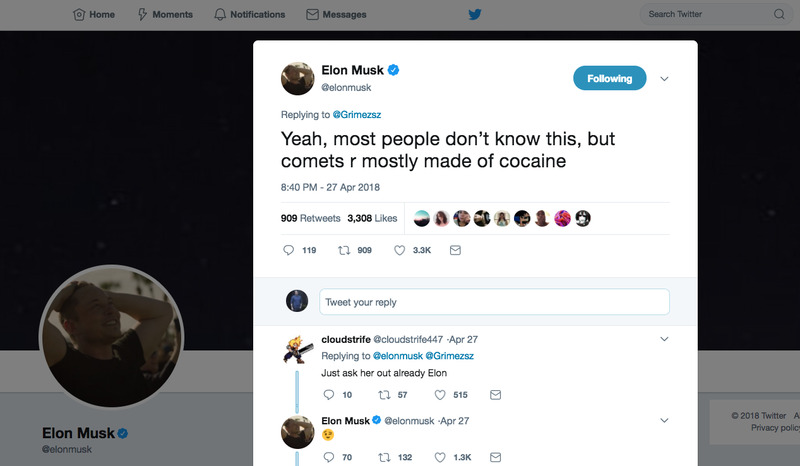 In the wake of the now-famous tweet, rapper Azealia Banks reportedly spent a weekend at Musk’s house while waiting to work on a collaboration with Grimes, which is where things get even more complicated, but more on that later. 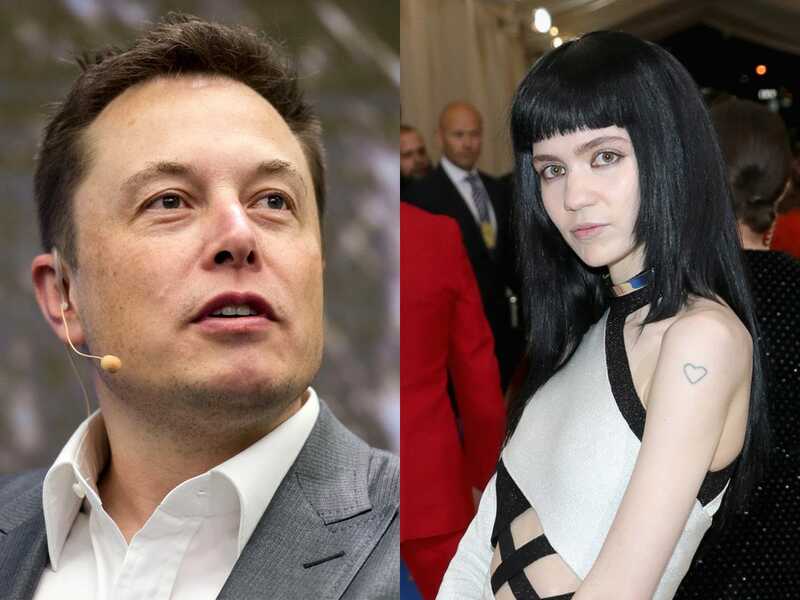 Now, the Tesla CEO’s relationship with Grimes could be on the rocks, as the two appear to have unfollowed each other on Instagram, and Musk has unfollowed Grimes on Twitter. Claire Boucher, better known by her stage name Grimes, is also a producer and outspoken advocate for female artists and their treatment by the press and music industry. She’s released multiple albums to critical acclaim, and her breakout album, “Visions,” won the Juno Award for Electronic Album of the Year. She first met Elon Musk over Twitter. 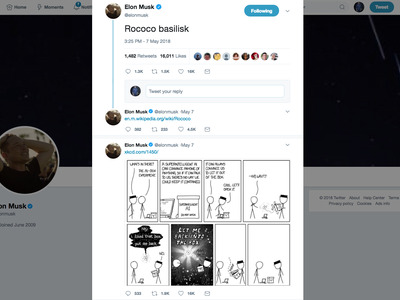 Musk was planning to make a joke about artificial intelligence — specifically, about the Rococo Basilisk character in her “Flesh Without Blood” video — and discovered she had beaten him to the punch. In May, shortly before the Met Gala, Page Six reported that the pair had been “quietly dating” for a few weeks. The report announced that the couple planned to attend the Met Gala together, and that they had been tweeting at each other for a few months. The report proved accurate, and Grimes did end up attending the Met Gala with Musk, which was their first official appearance as a couple. News of their relationship spurred plenty of memes as many were caught be surprise. There was no shortage of jokes the week their relationship was announced. Learn more about the extension here. 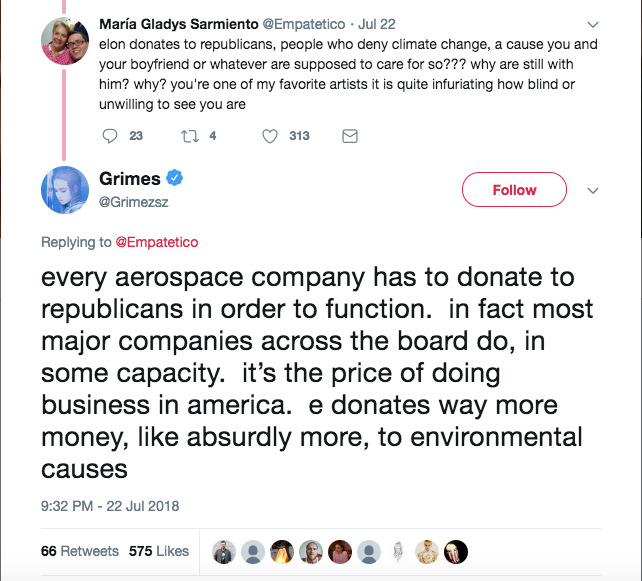 Grimes has taken to Twitter several times to defend Musk and Tesla. In since-deleted tweets, Grimes said Musk has never tried to stop Tesla workers from unionizing and claims she encouraged a union vote among Tesla employees. 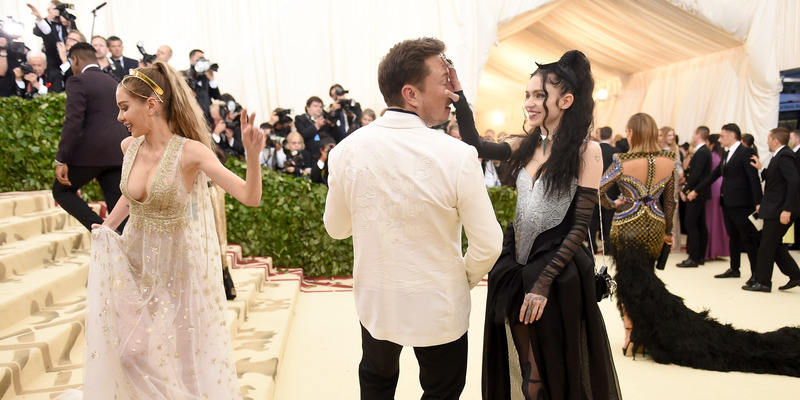 Grimes has also attended official events with Musk — like the Hyperloop Pod Competition in July. She and Musk, along with his five sons, made an unscheduled appearance at the event. 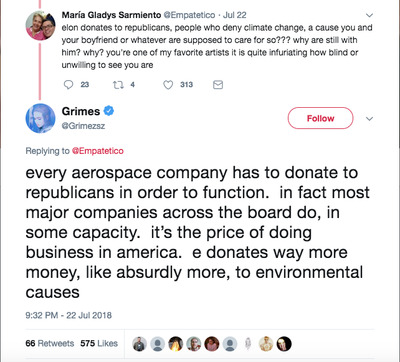 In July, after it was revealed that Musk has made donations to Republican political committees, Grimes defended his choice. 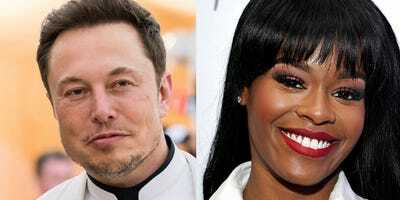 A few weeks ago, rapper Azealia Banks claimed to be at Elon Musk’s house in Los Angeles during the weekend while he was “scrounging for investors” following his tweet about possibly taking Tesla private. Banks posted on Instagram about the ordeal, saying “I waited around all weekend while grimes coddled her boyfriend.” According to the rapper, she and Grimes had planned to collaborate on some upcoming music, so she had flown to where she was staying. 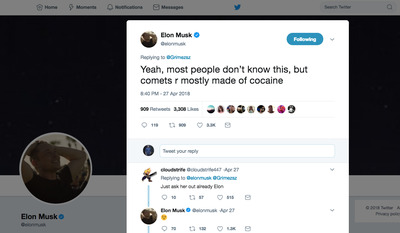 Musk denied he had ever met or communicated with Banks. 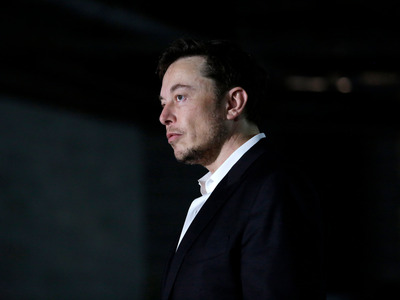 With increased scrutiny of Tesla’s financial future coming from both the press and the SEC, Musk and Tesla have been busy detailing more information about the possible plan to take the company private. Musk recently gave a brutally honest interview with The New York Times, where he revealed that the “excruciating” last year of work had begun to impact his personal health. 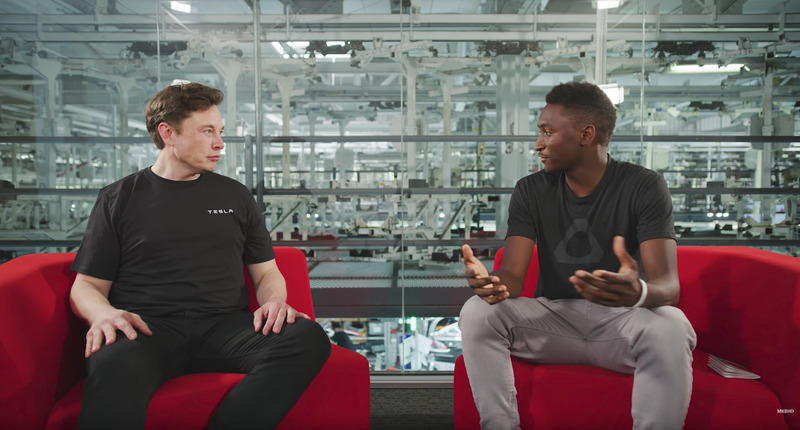 YouTube/Marques BrownleeMusk also gave an interview in recent days to popular YouTube product reviewer Marques Brownlee. Speaking with the Times, an emotional Musk “choked up” at points during the interview as he recounted what he called “the most difficult and painful year of my career.” He also said he’s been having trouble falling asleep. But even more recently, Musk and Grimes have unfollowed each other on Instagram, and Musk unfollowed Grimes on Twitter, which has caused some to speculate that their relationship may be rocky at the moment. The couple unfollowed each other on Instagram over the weekend, but Grimes still follows Musk on Twitter as of press time Monday, and neither has made any public statements about the status of their relationship. 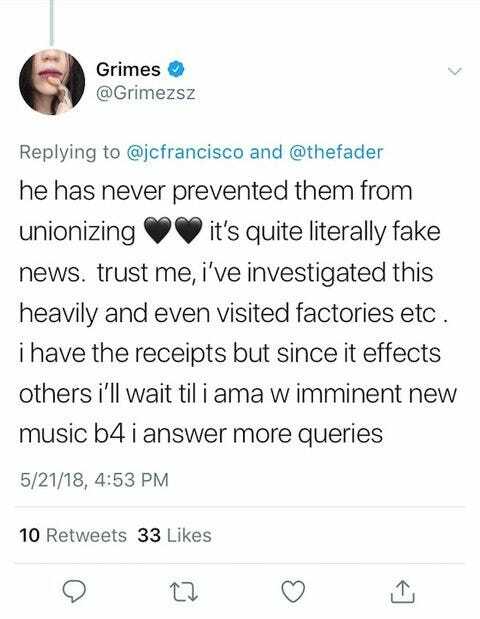 As Musk continues to oversee Tesla and SpaceX, Grimes continues to work on her music, but you might have to wait a bit for her next album. After initially teasing an upcoming album was coming out this year, she said on Instagram that she wouldn’t be releasing new music “any time soon,” and alluded to a rift between her and her record label 4AD.